On Thursday 14th June we marked the end of the second year of this enrichment project with Spires Academy and we celebrated in style with tea and cake, thank-yous and certificates. “Cathedral Spires” was the brainchild of Diana Francis, an inspirational teacher from King’s. It aims to bring pupils aged 11-12 from Spires to Canterbury Cathedral every week for a programme of cultural enrichment supported by students and staff from The King’s School. Each group has spent a term learning about the architecture, stonework and history of the Cathedral, visiting the archives and library, sketching in the Cloisters and meeting some of the key people involved in conservation and heritage. 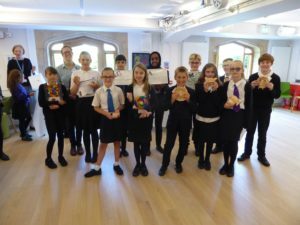 At Thursday’s celebration, the children gave their parents a tour of the Cathedral, recalling what they had learned (in some cases 2 terms ago) and showing off the magnificent artwork they have produced: clay gargoyles, stained glass and illuminated manuscripts. The Dean addressed the children and their parents, encouraging them to continue to develop their gifts and talents through trying out different activities, just as those the Cathedral Spires project has provided. He pointed to one of the Cathedral stonemasons who had chosen his career path as a result of visiting the Cathedral on a school trip. We’d like to thank all the staff at the Cathedral who have helped to make this project possible this year, and Mr Eliot Hearson, the King’s teacher who has taken on the baton from Diana Francis and led the King’s input to this collaboration.